Osvaldo Golijov admits drawing strongly from his personal history, which begins in Argentina and ends in the US via Israel. His teachers are indeed eclectic, ranging from George Crumb to Oliver Knussen. In lesser hands, this almost over-diverse set of cultural and pedagogical influences might well have ended in an unidentifiable pastiche. 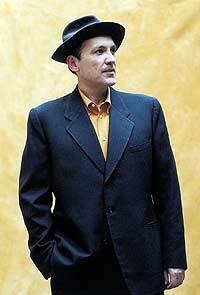 However, what becomes clear as one listens to more of Golijov's compositions is the unmistakably first-person voice identifiable throughout his works. Clements implied that the event suffered from an "unvaried diet" of Golijov's music and that a mixed programme of composers might have improved the experience. To this I must plead guilty. When we began to programme these concerts two years ago, virtually no one recognised the name of Osvaldo Golijov - much less knew how to pronounce it. In this context I felt it essential to provide an introduction without apology. To hear a new creative voice for the first time is obviously an unrepeatable opportunity and I wanted to ensure that all those present, either in person or via the Radio 3 broadcast received a full opportunity to experience this already iconic voice. Golijov and the listening public deserve nothing less. Let me not be mistaken: I agree with Clements on a number of issues raised. Golijov's work does indeed raise many questions, not all of which have yet been answered; a composer of 45 years has not yet fully realised his potential and therefore a tendency "to wear all his stylistic badges at once" does exist. But this speaks to me of a professional creative force that is still not yet fully resolved and therefore promises much for the future. From today's Guardian. Follow this link for Andrew Clements' original review.